To say that I'm excited about the new Martha crafts line would be an understatement. Since I started reading the magazine I have always wanted to get my hands on some of those beautiful storage boxes, elegant little labels, lovely striped ribbons and pretty papers. They are now all available, as of this month, at 900 Michael's stores across the U.S. and Canada. 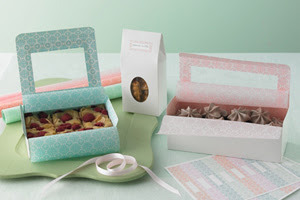 Americans can also order on a new website: marthastewartcrafts.com. (Shipping is limited to the 50 states.) I've gathered a few of my favourite things in a collage below, but please get out there and browse on your own. 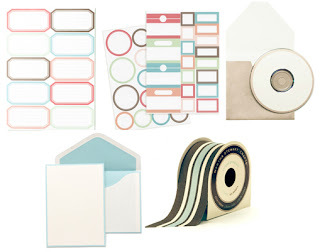 Martha Stewart Crafts also provides simple, elegant stationary and perfectly plain CD labels and envelopes. The ribbon is lovely, too. Above are some of my favorites. Below is an example of the food packaging that is available. Also on my list are a variety of archival storage boxes for photos and papers. The scrapbooks, while expenisve, are archival quality and at least one of them will find its way into my home.